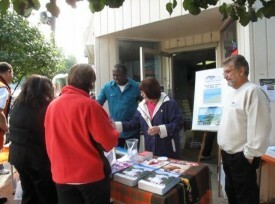 (New York, NY, October 4, 2010) Antigua and Barbuda’s US Tourism Team has kicked off its fall promotions by partnering with GOGO Vacations and Vacation Center, to promote the destination at the 42nd annual Apple Harvest Festival in Southington, CT.
For the third year in a row, the Tourism team was the sole destination sponsor at this community pride event that attracts over 100,000 New England residents. Festival goers come to celebrate the harvesting of the bounty from surrounding apple farms that are an integral part of the culture of these suburban communities. 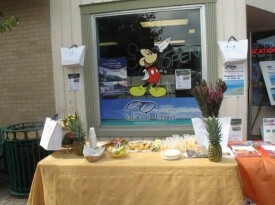 Antigua and Barbuda set up a booth in the quaint New England town of Southington, CT in conjunction with Vacation Center, one of the largest travel agencies in the community. Key principals at Vacation Center, Bill Lynch and Peggy Ahrens were able to generate considerable business on the spot as the combined team intercepted hundreds of festival goers who are beginning to plan their winter getaway vacations. These seasoned travel agents are frequent visitors to the twin island destination and have extensive experience in selling Antigua and Barbuda for more than twenty years. New England is one of the second largest source markets for visitors from the United States to Antigua and Barbuda and many patrons were already familiar with the destination. There was significant interest in special packages and promotional offers as well as the two prize drawings to St. James’ Club and Sugar Ridge Hotel. To increase excitement about the destination at the Festival, there was steel band music and samples of the Antigua black pineapple and freshly brewed tea that combined mango and pineapple with locally harvested apples. The Southington Apple Festival continues into next weekend with an Arts and Crafts display that is expected to attract hundreds of vendors and showcase local artistry and craftsmanship. This annual festival is a family oriented community event spanning the first two weekends in October and offers seven days of spectacular fun, delicious food, live entertainment and crafts. It also showcases local organizations and volunteers that make Southington a wonderful community to live in and visit.